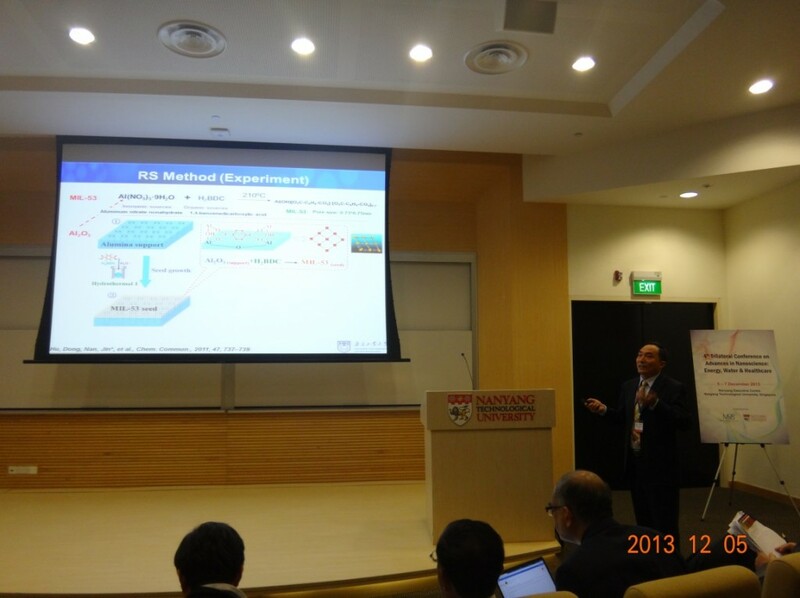 From December 4th to 7th, 2013, Professor Wanqin Jin was invited to attend the 4th China, Singapore and India trilateral conference with the theme “Nanoscience: Energy, water & Healthcare”, held in Nanyang Technological University of Singapore. This conference invited experts from Materials Research Society of China, India and Singapore, aiming at enhancing academic exchange and multilateral technological cooperation among the three countries. On 5th, December, Professor Wanqin Jin was invited to deliver a report with the topic of “Preparation and application of MOF membranes”, who introduced the latest MOF membrane achievement of his research group, new methods in preparing MOF membrane (Reactive Seeding, Step-by-step Seeding Procedure and Cycling Precursors) and application of MOF membrane in gas, pervaporation and chiral resolution. At the 3-day meeting, experts from the three countries made adequate academic exchange and communication and knew about the latest research condition, especially synthesis, characterization and application of new Nano materials, which can be used as reference for membrane material research. At the same time, the meeting will lay solid foundation for international cooperation. Professor Wanqin Jin was delivering a report on the 4th China, Singapore and India trilateral conference.